When I read these lines in Koethe’s poem I immediately thought of Alice Zorn. It’s such a perfect description of how her new novel, Five Roses, is written… all rhythms and patterns, loops, questions and connections that satisfy in surprising ways while leaving us with yet another question we’re only too happy to contemplate until the loops and connections bring us to the next answer. And so on. No words are exchanged yet the moment says so much about the community that exists here and the importance of knowing how to navigate it. Of course not everyone knows the rules of navigation and part of the happy trip of reading Five Roses is being privy to the learning process, watching the naifs and the newbies try to ‘get it’. There is Maddy, who we first meet in the 70’s when, as a naïve teenager, she finds herself living with hippies in a Pointe-Ste-Charles flophouse where “…They weren’t homes but steps toward homelessness.” The hippies ultimately leave but Maddy stays, eventually owning the house and working as a *baker at the nearby Atwater Market. It all sounds nice enough but survival, unlike so much in The Pointe, doesn’t come cheaply and she’s made some hard choices over the years. The women well represent the burden of secrets and private lives that each of us carries. Meanwhile the neighbourhood, The Pointe, where it’s assumed there are secrets (what’s life without secrets?) is a mecca of mash ups and messed up lives within which a unique community is formed. Both the women and the neighbourhood share a history of harshness, yet there’s forgiveness at the same time. Whatever you call it, there’s comfort there once you accept it, and it accepts you. The book reminds me that every kind of neighbourhood, no matter how unassuming, has its own vibe and perhaps even draws a certain kind of person to it for whatever reason. Sometimes it’s so the person can give something to that particular place, other times it’s because they need to receive something that could come from nowhere else. I like walking around neighbourhoods, seeing how they’re laid out, where do people buy bread, how far is it to the library? I like getting a glimpse of life through the windows and wondering who lives there and who lived there before. It’s less the way a place looks that strikes me as how it feels. And this is what Alice Zorn does— she takes the reader by the hand and says see this house, this street? Let me tell you the story of it. And it’s not a story you hear or even read so much as feel. So, yes, if there’s ever a Five Roses walking tour, sign me up. 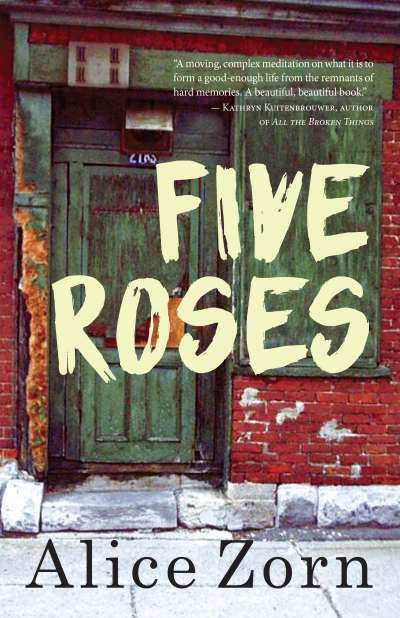 —Five Roses can be ordered on-line from Blue Heron Books. Obviously, I’m a somewhat partial reader (not quite a bystander), but I loved reading this. Thank you, Carin. i enjoyed this book very much but found the scene with Rose and Kenny quite jarring and wonder what its real purpose was. it changed my attitude towards Rose. if that scene had played out with the roles reversed, Rose would definitely have been afraid of Kenny and would have wanted to avoid him, yet she seems sad and a bit surprised at his change in attitude towards her. That part just did not ring true. Nevertheless, the book is very well written and really draws you in and you do want to know at the end how they will all continue with their lives. My take was that she was just such an innocent, almost clueless in the ways of interacting with people. I know what you’re saying about the scene and the aftermath, but I connected it to her only other experience of men, which was Armand, and how she assumed ‘that’ was what men wanted. What SHE wanted, or any kind of emotional connection on a deeper level, seemed not even to register with her, at least not yet. This is all part of what I imagine lies ahead for Rose… all these layers of discovery where relationships are concerned. I picture her as this strangely quiet, almost wild thing; a sweet unwitting eccentric whose (artistic & other) journey is just beginning. Speaking of beginnings, how did you find the ending? Thank you, Matilda, for this astute explanation which is how I would rationalize Rose acting in the way she did. It (Rose/Kenny) was definitely a ‘moment’… I felt it too. My favourite thing about Alice’s style is how she takes the ‘everyday’… the simple gesture we might overlook, and subtly brings our attention to it so that we see it for what it is on a deeper level, something that resonates emotionally. I often find myself nodding (or laughing) when I read her work. (Love those moments of ultra dry humour that just ‘appear’.) She’s so good at this kind of detail. You might like her short story collection, ‘Ruins & Relics’. If you read it, Jeanne, let me know. Would be fun to discuss.